It’s Ramazan and my mother is in the kitchen, slaving over a hot stove preparing a big feast. She’s fasting, even though she is a 64-year-old diabetic. As for myself? Earlier in the day, I had a huge fish and chips platter for lunch, but my Muslim family believes I’m fasting with them. During the month of Ramazan, most of the world’s 1.8 billion Muslims will observe by basically not partaking in any vice for 30 days. From sunrise to sunset, all able-bodied Muslims are required to “fast”; prohibited from eating, drinking (yes, even water), smoking, cursing, bad-mouthing, and any sexual behaviour. Fasting during this month is one of the five pillars of Islam, and not doing so can not only invite social ridicule within the Muslim community, but in certain Muslim countries can also lead to a fine or even being jailed. Most Muslims look forward to Ramazan every year, because they see it as a religious cleanse that leaves them more pure and sets a tone for the rest of the year. That’s if you actually believe in the faith and practice it, which I don’t. But the Muslims around me don’t know that. Unfortunately, I and many others like me dread Ramazan because it means another month of being dishonest to our Muslim families and friends. See, there are many reasons why someone who comes from a Muslim background doesn’t fast during Ramazan. They may still have faith in the religion, but don’t take it as seriously as they should. They might think fasting is more for traditional Muslims, and they consider themselves more of a casual Muslim. Another reason is they may have completely left the religion, but haven’t “come out” to their Muslim community – something many young people from these backgrounds struggle with, and this is exactly where I fall. Like many other millennials, we just aren’t religious, but we just so happen to come from a religion that is customarily harsher with the idea of apostasy compared to other religions in the West. This results in an ideological struggle between older and younger generations of Muslims that has even been depicted in recent pop culture, from the bacon eating scene in Aziz Ansari’s Master of None to Kumail Nanjiani’s The Big Sick, where his parents disown him because he wants to marry an American white woman. This is happening in many Muslim homes, where first-generation millennials have views on religion that go against the very strict nature Islam can have. We might view ourselves as Muslim by identity, and even speak out against Muslim discrimination, but are far from practicing. 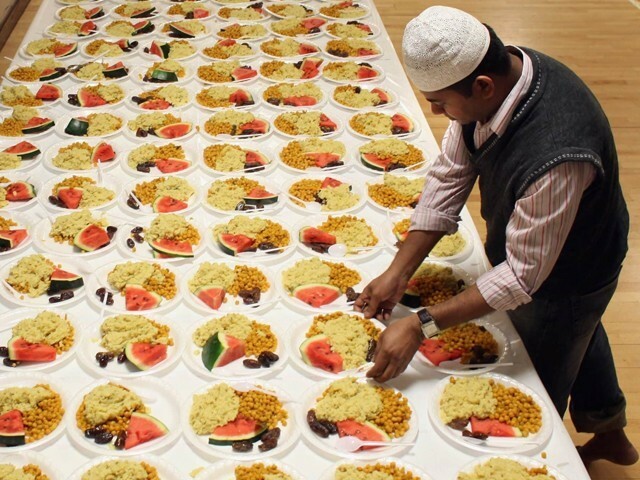 Ramazan for us can be extremely complicated to navigate since it’s so important in Islam. Rather than “coming out” to our family and even friends, we know if we can just get through the month, we’re pretty much good for the rest of the year. Some might fast just for the sake of it with no real spiritual intention; just for show. Others might try their best to avoid their Muslim associates and families altogether. But probably the most insincere practice is what I call “fake fasting” – acting like you’ve been fasting all day and “breaking your fast” at night, as if you weren’t eating double cheeseburgers and chugging Diet Cokes all day. Many do this in order to keep the façade going; that they are still a practicing Muslim. This is done only to avoid cruel judgment from other Muslims and is totally not the point of fasting during Ramazan, which is actually supposed to be a spiritual journey of struggle in order to come closer to God. Hiding the fact I’m not fasting from the Muslims around me was difficult at first, but it’s a skill I’ve now fine-tuned. It all really depends on the size of the town you live in and how many Muslims are in it – the smaller the town, the more challenging. If you’re bound to run into a Muslim you know, you certainly don’t want to be caught holding a Starbucks caramel latte during the day. They’ll give you a piercing look of judgment, followed by disappointment. I’ve had times where I literally looked left and right before drinking water while driving around my mid-size suburban hometown during the day. When I go out for lunch, I always make sure to eat at restaurants Muslims wouldn’t be anywhere near – bars and Hooters are always a safe bet. Obviously avoid the halal markets and the falafel joints. Let’s say you get through the day without anyone knowing you’ve been eating or drinking. Now the ultimate challenge: you have to act like you’re just as hungry as your fellow Muslims at sunset. This is where guilt can really set in. You sit down for dinner where everyone has legitimately been starving all day, meanwhile you ate a big bowl of chilli just a couple of hours prior. Sometimes, certain people can tell just by looking at you that you haven’t been fasting; it’s like a weird sixth sense they have, and you just have to hope they don’t call you out. This puts myself and others like me in a weird predicament. Either we just come out and admit we don’t fast and face whatever backlash, or we continue to live a lie for one month every year. But until I do end up making a decision, I’m going to enjoy this chicken kebab over rice. The author is a contributor for Vice. You can probably describe me as one of the casual Muslims that you speak off in this article, though I am not sure about the degree to which I could be called a casual Muslim. To remove your guilt, just tell your parents that you are not Fasting and give your reasons for staying away from the fast, avoid making the reasons too philosophical and just give a cliché answer like you find it difficult to keep it because it is too long or you feel thirsty at work etc. No need to give any controversial reason, keep it plain and simple. I did this and it has been fine with me though I must admit my family, and not only my parents, are very understanding so if you have family members who think that your act of non-fasting will result in the fire’s of hell destroying them, then I can imagine why you wouldn’t want to discuss this matter with such relatives. I still try and fast during the weekends, and attend the occasional Tarawee prayers, but that is the extent of my fasting during Ramazan. I also keep my act of non-fast as discreet as possible even if I know my family members are aware that I am not fasting, I still don’t mention the hearty breakfast I had at 7 in the morning to them. It is about respecting the fact that they are fasting and I don’t want to come across as bragging in the sense that I have been having double cheeseburgers while the rest of them have been starved of any food since sun rise. There is nothing Liberal in being so ill-mannered so as to not respect someone’s observance of their religion. Good luck to you. Big deal! I know many who do that. You fake-fast because you respect your family and the people you live around. You should be happy about it rather than frustrated. I mean that only shows that atleast you have good values. being honest is one of the quality of being Muslim. Atleast he admitted his act and we should know there are many who fast but their actions and doing are none less then they are doing fake fast. It is the intentions which counts !!! An honest discussion on how many elderly and or sick individuals die from trying to fast all day all month needs to happen! From your write up it appears you live in America…..and it appears you are being pulled in two directions and it will be you and only you who will have to decide where you want to be. India has only 4 consulates in Afghanistan and only 2 of them are near Pakistan’s border. India has had these consulates since 1949 and not added a single one since then. Incidentally Pakistan too has consulates in those exact 4 cities. for lunch! The terminology is all wrong. Nope, ain’t from Trumpland. Did not sound like it. Sounded more like sarcasm.